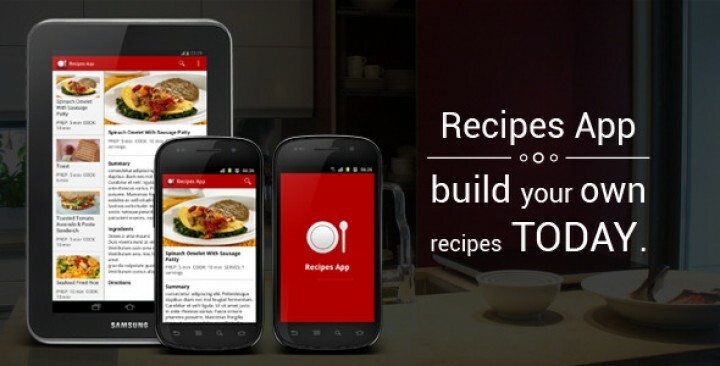 Recipes App is an application under Android platform which can be used to create application about food recipes. If you are a chef or have hobby in cooking then this app is perfect for you. you can create your own application about any food recipes and monetize or share it to the market. with basic knowledge of Android development and only few customization you can easily build your own recipes application. Holo Theme UI and Actionbarthe latest version of the app comes with holo theme and Actionbar that work in all Android versions. Tablet Supportthe latest version of the app comes with better multiple screen support. two pane layout will be displayed when app run on tablet and single pane layout when run on smartphone. Admob integrationyou can make more money with this app because it is integrated with Admob. Local databaseall recipes data are stored in sqlite database within the app. Sharing app featureuser can share app to their friends via email, facebook, twitter, or any other app. they can also rate the app on Google Play. Documentation file includedcomes with a documentation file to help buyer configuring the app.